A six-page story entitled "Kamikaze!" 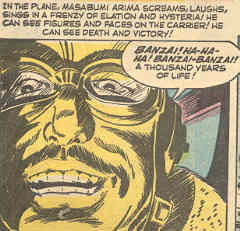 in the July 1954 issue of Battle comic book gives an incorrect and extremely exaggerated portrayal of Japanese kamikaze pilots. The author describes them as "a cult of fanatics bent on suicide for the emperor." The first half of the story introduces the suicide attack of Masafumi Arima on October 15, 1944, and the second half describes kamikaze pilot training and the suicide missions of two pilots. The comic fails to provide any accurate information about Masafumi Arima other than the date of his death. It gives his name as Masabumi rather than Masafumi and his rank as Vice Admiral rather than Rear Admiral. In the comic, he takes off alone piloting a Zero fighter at 5:20 a.m. from an aircraft carrier. In actuality, he sortied about 2 p.m. from Nichols Field in Manila in a Navy Type 1 Attack Bomber (Betty) as part of a crew that normally numbered seven, and his plane joined a group of about 90 to 100 Navy and Army planes heading toward the American task force east of Luzon . In the cockpit, a feeling of exhilaration overcomes the Admiral! It is wonderful to die! One has only to love the Emperor and death comes easy. Self-hypnosis takes effect! Masabumi Arima is drunk with divine joy! He wants no part of life or contact with life. So he rips away the man-made implements. In the frame just before he crashes into the sea next to the aircraft carrier (see image below at left), he "screams, laughs, sings in a frenzy of elation and hysteria!" Just who was the real Rear Admiral Masafumi Arima if not a wild-eyed zealot? He commanded the 26th Air Flotilla and served as an inspiration for future kamikaze pilots. Believing that the older men should lead by example and die first in battle, he announced soon before takeoff that he personally would lead the attack of October 15, 1944, against the American fleet. He radioed in this final message : "Going to body-crash against enemy aircraft carrier. Hope everybody will exert all-out efforts." Although no evidence exists that he hit any American ship, the Japanese military widely publicized the courage of his attack and his supposed success in sinking an aircraft carrier. He became the forerunner to the official Kamikaze Special Attack Corps that would be formed just four days later by Vice Admiral Takijiro Ohnishi. The second half of this comic introduces the kamikazes' training for death. The pilots sit cross-legged on the floor as some old man who looks almost like a magician tells them that they must give their lives to the emperor since he gave them the gift of life. The men reply like automatons, "It is our ardent wish and our joy!" The story then shifts to a kamikaze pilot who crashes into the flight deck of the aircraft carrier USS Intrepid and an ohka (called "baka" by the Americans) rocket-powered glider bomb pilot who misses his dive on an American cruiser. Both pilots have a change of heart as they plunge downward, and they suddenly want to live as fear grips them. The image below at right shows the ohka pilot as he "screams with insane zeal!" Although both of these kamikaze pilots fly their missions in the Philippines in 1944, the Japanese Navy did not use the ohka weapon until several months later during the Battle of Okinawa. This preposterous story ends with the dropping of an atomic bomb. 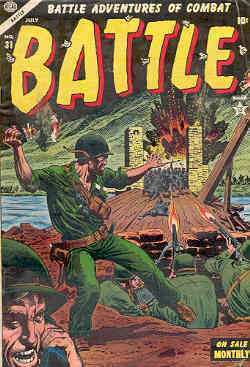 This issue of Battle contains three other comic stories set in the Revolutionary War, World War I, and the Korean War. 1. Inoguchi 1958, 36-7; Osuo 2005, 7; Ugaki 1991, 476; Warner 1982, 84; Yasunobu 1972, 44.